View of “Smuggling the Sun,” 2013. Eamon Ore-Giron’s paintings evoke that exciting moment at the advent of abstraction when static, retinal perspective no longer seemed capable of representing modern life and visual artists began looking to other art forms such as music and new technologies, including automobiles, airplanes, and moving pictures, for novel ways to arrange form. The ten small-scale paintings the Los Angeles–based artist presents in “Smuggling the Sun,” his first solo exhibition in New York, borrow elements from several painters who were instrumental in the early formation of nonrepresentational, geometric art. There is the Delaunays’—husband Robert and wife Sonia’s—Orphic palate of warm primary and secondary hues, anchored by green tints and shades of blue and by the couple’s signature concentric circles, often broken into halves or quadrants of alternating colors. Paintings like House Broken Home Wreckin, 2013, inherit an oblique perspective seen in the mechanical drawings of a certain vintage, namely—if faintly—the sleek, seemingly rational designs of Marcel Duchamp and Francis Picabia. Here, rationality is pared down to the basic elements: Red, orange, and green rays extend toward circles defined, in part, through their absence by empty, raw space, recalling cogs arranged in some type of schematic motor. 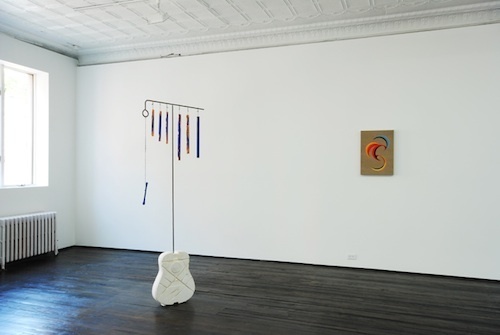 Ore-Giron is also a musician, which explains the presence of the exhibition’s only sculptural piece, E-D-G-B-D-G (OPEN TUNING), 2013, an instrument Ore-Giron has used in performances. It includes a set of copper chimes hanging from a steel armature, forming a musical scale of the artist’s own design based on the Yaraví music native to the Central Andes, which is constructed around an “open” tuning system, the plastic approach to achieving a chromatic scale with an instrument’s component parts. Open tuning systems allow ambitious and inventive musicians great latitude, having birthed several hybrid styles of folk music from Delta blues to Hawaiian slack-key guitar. The piece is a testament to the fluidity with which Ore-Giron incorporates references to culture, form, and precedent in his live work. That boundless and productive sense of citation has carried over to his painting, where Ore-Giron’s sampling from the history of abstraction remains just as open.